This is my favorite application for Halloumi, a cheese that holds it shape when grilled. Use any vegetables that you like. I've used Oven Dried Tomatoes and artichoke hearts with a simple lemon dressing. Whisk oil and lemon juice together until mixture begins to emulsify. Mix a pinch of salt and oregano into dressing and set aside. Heat canola oil in a grill pan over medium heat. Add Halloumi slices to grill pan and grill for about two minutes on each side until starting to brown. 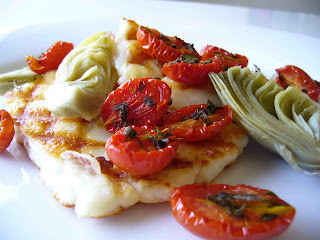 Place two slices of Halloumi on each plate and top with half of the artichoke hearts and tomatoes. Drizzle with dressing and enjoy! That looks delicious. I'm going to have to try and find halloumi at the supermarket! I have to admit, I don't konw what halloumi is, much less tried it. But it sounds delicious. i love cheese.